Those of you familiar with the Smokies may be asking yourselves, “What does she mean by Hyatt Gap? There is no Hyatt Gap!” That is the same question I asked myself when I received an e-mail from Mike Knies suggesting an outing at Hyatt Gap. But I quickly realized that he meant the gap on Hyatt Ridge situated where the Hyatt Ridge trail makes a right-angle turn to the north and the Enloe Creek trail issues forth, making a descent to Raven Fork. Its official name is actually Low Gap, but I like Mike’s name better, since to most people Low Gap refers to another place entirely, on the A.T. near Cosby. 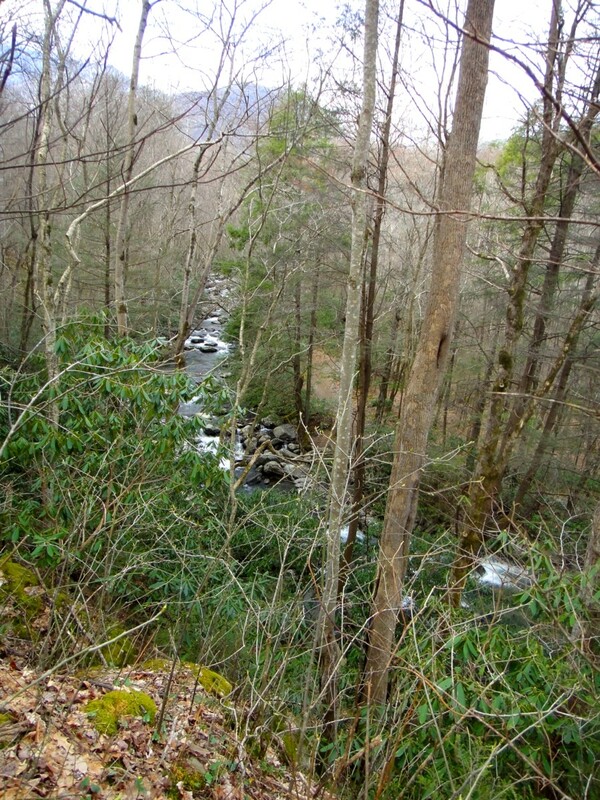 I was already familiar with Hyatt Gap, since I have adopted the Enloe Creek trail for maintenance, and I have to hike the 1.9 miles, 1500 vertical feet to the gap from the Straight Fork road just to get to the start of my trail. Map section showing unmaintained manway from Hyatt Gap. It crosses the reservation boundary. Mike provided this map section from the 1951 map. 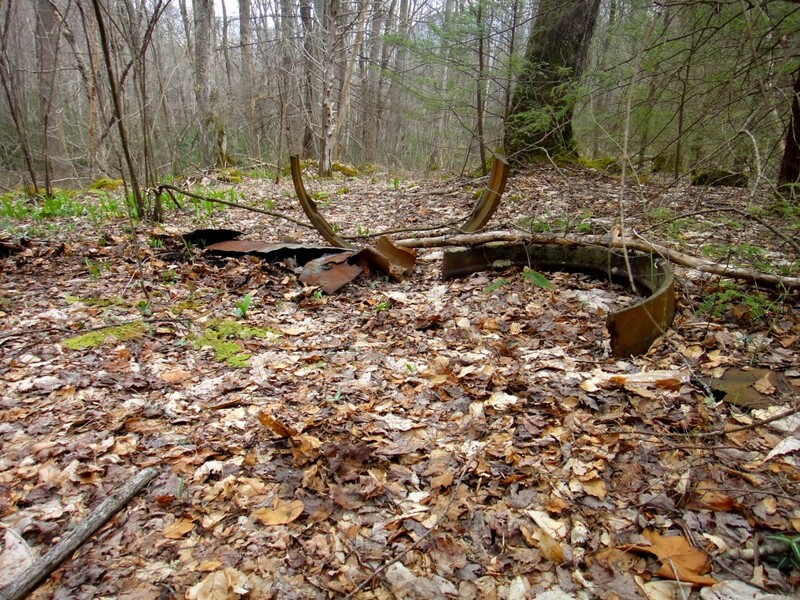 Our quest was to follow the dotted line southward from the gap, cross the boundary of the Cherokee reservation a little to the east of the top corner, and pick up the old railroad grade that angles back to the Straight Fork road. We weren’t sure exactly where the railroad grade came out on the road, but we knew it was at about 2700′, so we left a car a little above that elevation point for shuttling back to the trailhead. Our group consisted of Mike, David Hughes, Seth O’Shields, and myself. I had arrived in the area a little early, so I detoured up to Oconoluftee for a few minutes and spotted some elk in the big meadow. Before we started down the manway, we made the trip down to Raven Fork. 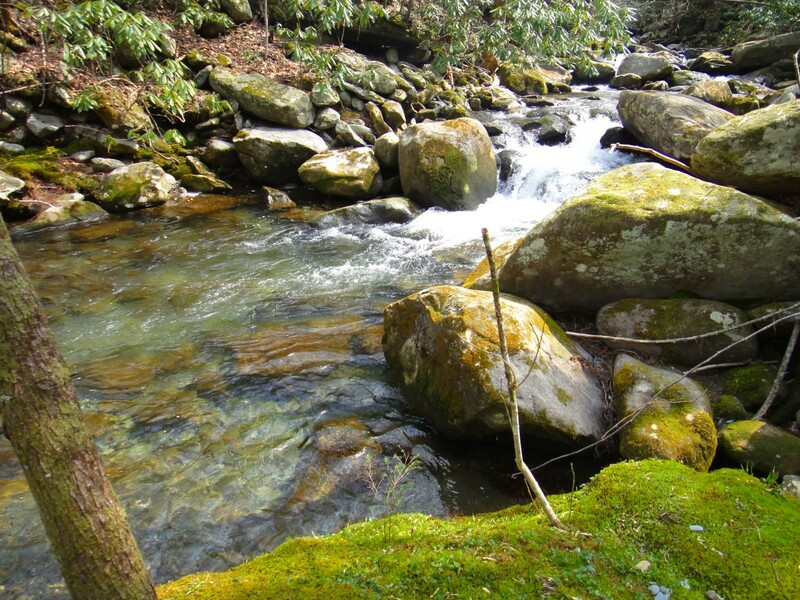 Where the Enloe Creek bridge crosses the stream is one of the most magical places in the Smokies, in my opinion. This time I became fixated on a particular deep, beautiful pool just below the bridge. Its translucent green-blue water seemed to contain myriad shapes that kept shifting, as if they represented some sort of prophecy—or perhaps some retelling of events of the deep past. The next three pictures show in succession the upper part of the pool, the middle, and the lower. Click twice for zoom if you want to clearly see those shifting shapes. After clambering around for a bit on the big boulder above the bridge that has the three hemlocks growing out of it, we tackled the climb back up to the gap. The start of the manway is quite obvious there once you look for it, though I have to admit I had never really noticed it before. But that is what’s really wonderful about these unmaintained trails. We never had much trouble seeing where the manway went. At the beginning it was quite wide and comfortable for walking. 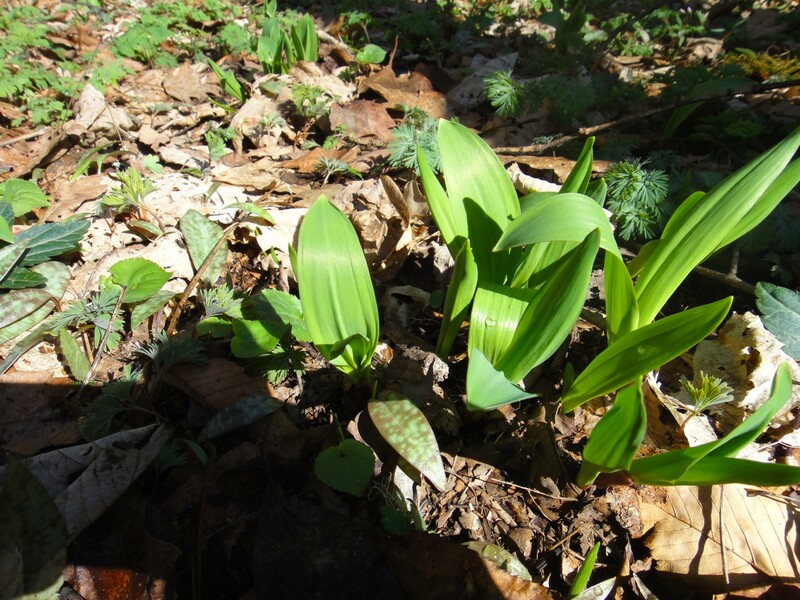 We saw lots of ramps (for those of you not familiar with this local delicacy, ramps are a pungent kind of wild onion). 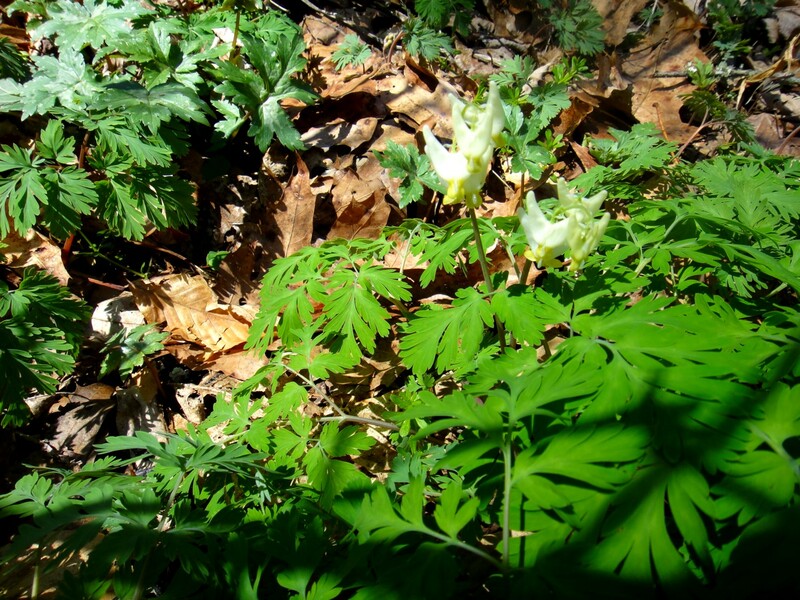 We saw a lot of wildflower foliage, but not much that was actually blooming except for spring beauties. 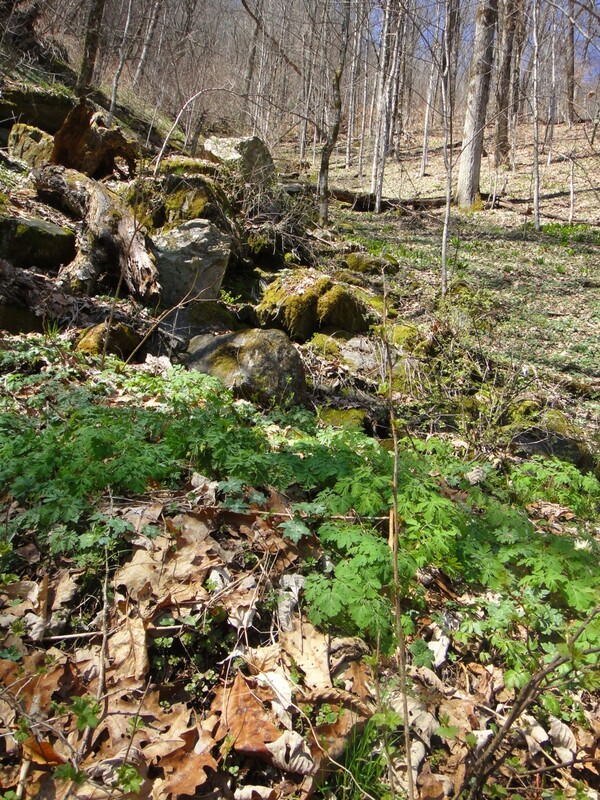 We did see some Dutchman’s breeches at a spot near where a little stream trickled down the slope. It was somewhere around this spot, a mile or so into an estimated three miles of manway, that the treadway narrowed and the slope steepened—clearly, the steeper the slope, the more rapidly the pathway erodes and “slides” down the mountain. The footing became awkward and somewhat uncomfortable, with the left foot (on the outside) taking the brunt of the weight. Seth developed a blister and David’s left bootlace snapped in two. 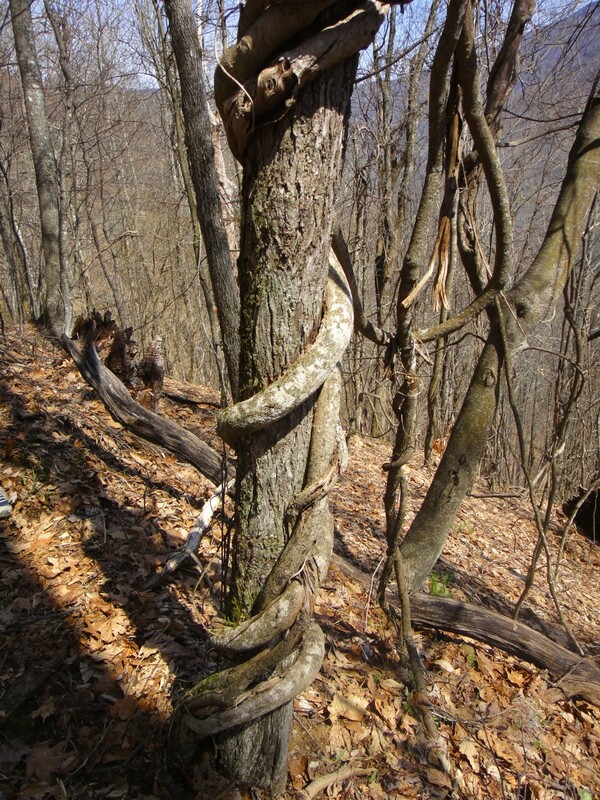 We passed a tree with a corkscrew vine. We persevered and eventually crossed the boundary into the reservation. 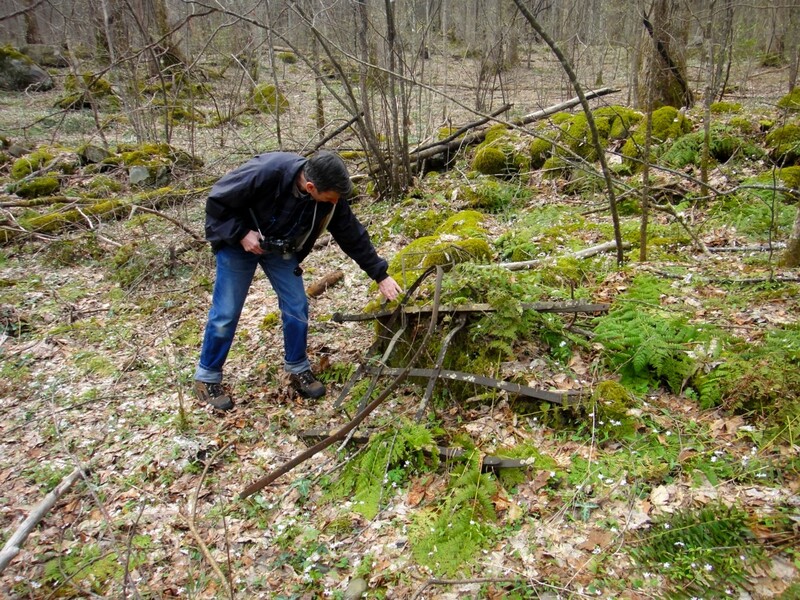 Just past the boundary, we encountered a confusing network of paths and old roadways that weren’t shown on any of our maps—even though Mike had brought along three or four different maps, seemingly representing all decades of the mid- to late-twentieth century. Some of these paths were probably ATV trails. Our manway widened out into a roadbed and started to climb fairly steeply. This didn’t seem right to us at the time, although Mike now theorizes that this was actually the correct route. 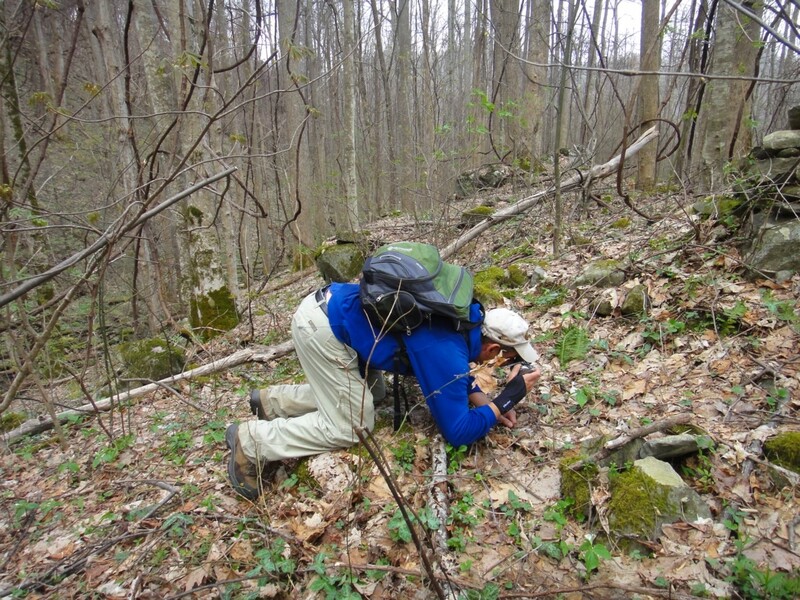 We opted to angle downslope (east) along another faint roadbed and see if we could pick up the railroad grade. When we became mired in thickets of unusually thorny blackberries punctuated by swarms of aggressive gnats, we decided to break away and head straight down off-trail and intersect the railroad grade. We went down right along the boundary and found the grade before long. From there it was not too far to the Straight Fork road, which we reached a little below the stashed car, as planned. Our ankles and heels complained somewhat from the extensive sidehilling, but it was an interesting and enjoyable outing nevertheless. The weather had been turning all day, and it started drizzling just as we completed our adventure. 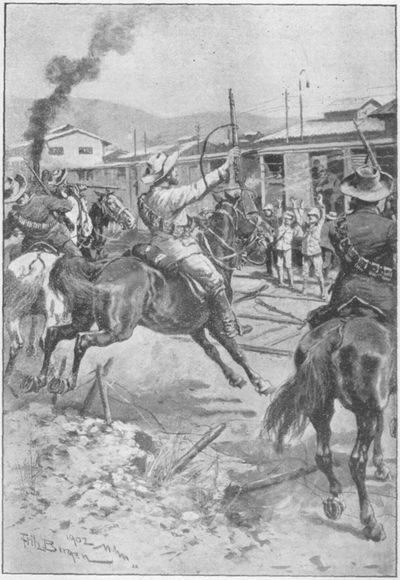 This is the continuation of a good old-fashioned piece of serial fiction about Jack Brown, who is from St. Louis and has gone to South Africa to fight with the Boers. The time: February 1900. The serial starts here. Jack and Wilbur both had to adjust to the different style of saddle and bridle. 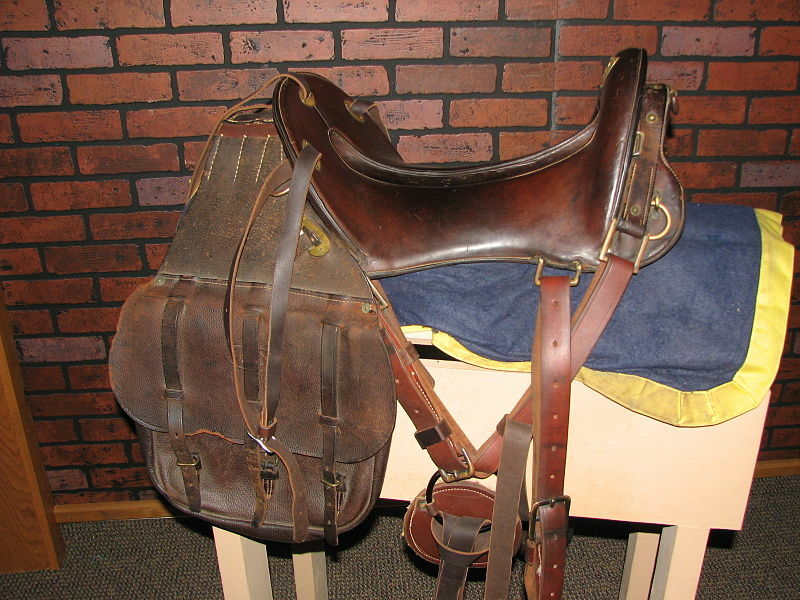 Jack had ridden most of the time with an old McClellan saddle his uncle had given him, while Wilbur had ridden with Western gear. Both had a deeper seat than the Boer saddles, which were more like English ones. 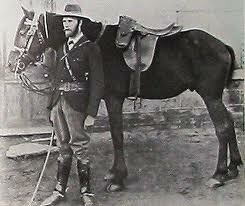 After Piet Fourie had gotten the ox convoy sorted out, General De Wet divided the men into two groups. One was to accompany the convoy to Edenberg, where the vast English booty could be sorted out. 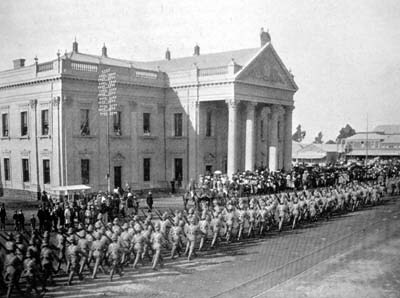 The other group, consisting of 150 men, was to proceed with De Wet toward Paardenberg Drift on the Modder River, where Lord Roberts was believed to be closing in on General Piet Cronje. At first it seemed that Jack and Wilbur would be shunted to the Edenberg party—the one less likely to become involved in a major conflict—but Japie pushed for them to come with him in the Paaardenberg group. De Wet said, “I demand unconditional surrender. I give you ten minutes from the moment you dismount on arriving at your camp; when those ten minutes have passed I fire.” The orderly galloped back to his camp, and immediately the white flag appeared. The result: 58 British prisoners, who were sent off under guard to join the Edenberg convoy. But the pleasure of this small victory was soon erased when a party of 100 Boers approached under Commandant Lubbe. He reported that General French had relieved Kimberley on the 15th and that Cronje was retreating toward Paardeberg. De Wet was visibly angry at this news—partly because he had sent Lubbe earlier to assist Cronje, and now Lubbe had come back rather than face up to the fight. Jack observed the ripple of melancholy pass over the men’s faces. The siege of Kimberley over—after 124 days. It had been one of the very first accomplishments of the war. And now Cronje, with his force of 4100, was under serious threat. He was all that stood between the massive army of Lord Roberts and the town of Bloemfontein, the Orange Free State capital. The sun had gone down, and the men settled in for a meal and some rest. However, orders came from De Wet that they were to upsaddle again at midnight. 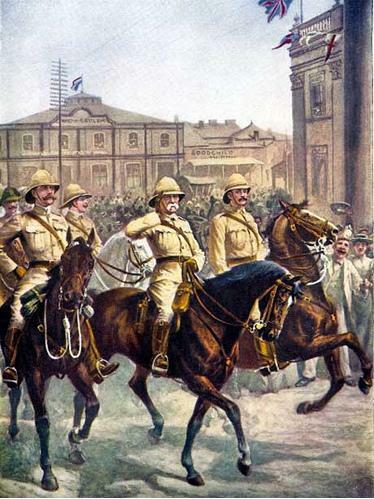 They would be joined by men under General Jacobs and Commandant Hertzog to meet an advancing force of English coming from Belmont: it would be 300 Boers against approximately 10,000 English. #Christiaan De Wet, Three Years’ War. Charles Scribner’s Sons, New York, 1902. 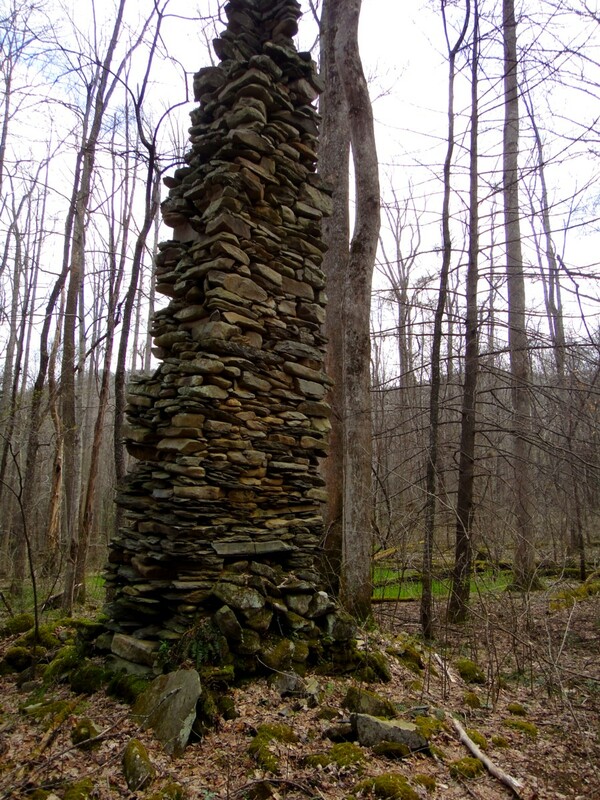 Posted by Jenny in bushwhacking, history, Smoky Mountains. When Ben Bacot told me the plan was to go to the Horseshoe in the Greenbrier, I was confused at first. I thought he meant going up Horseshoe Mountain, over by Mt. Kephart. But when I considered other clues—especially thinking about a dramatic hike in high-water conditions that I knew he and Mike Gourley had made a couple of weeks ago, I realized he meant something different. Plus, I knew Mike Maples would also be along, and I know he likes to prowl around areas with old homesites and cemeteries. I figured it out. 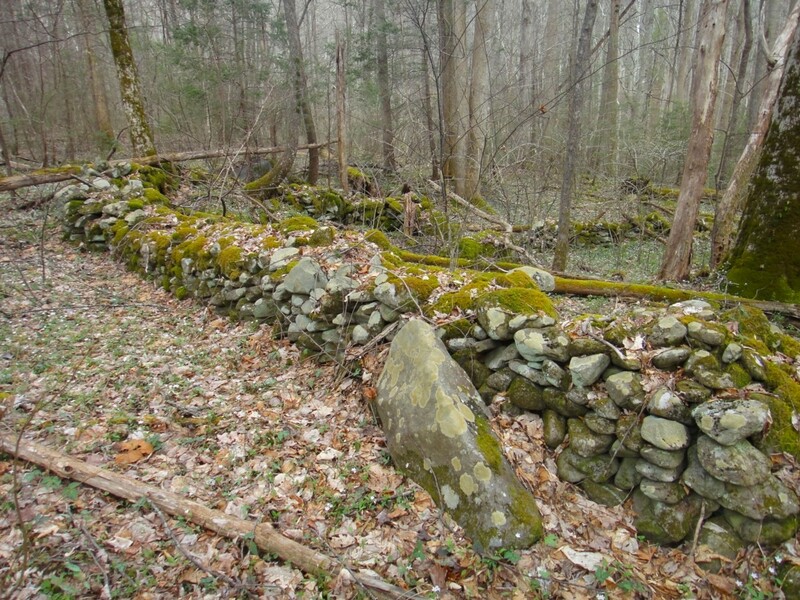 We would be exploring an area between False Gap Prong and Porters Creek, a place rich in human history with many old homesites. The area is known as the Horseshoe because it is bounded by the horseshoe-shaped northern end of giant Porters Mountain, which extends southward all the way to the A.T. Mike M. told us that during the Civil War, when the settlement was being raided by bushwhackers, the residents would turn their horses loose to run up into the Horseshoe, where they were essentially enclosed by the steep walls of Porters—but harder for the bushwhackers to catch. We started just past the bridge that turns toward Ramsey Prong off the main Greenbrier road. 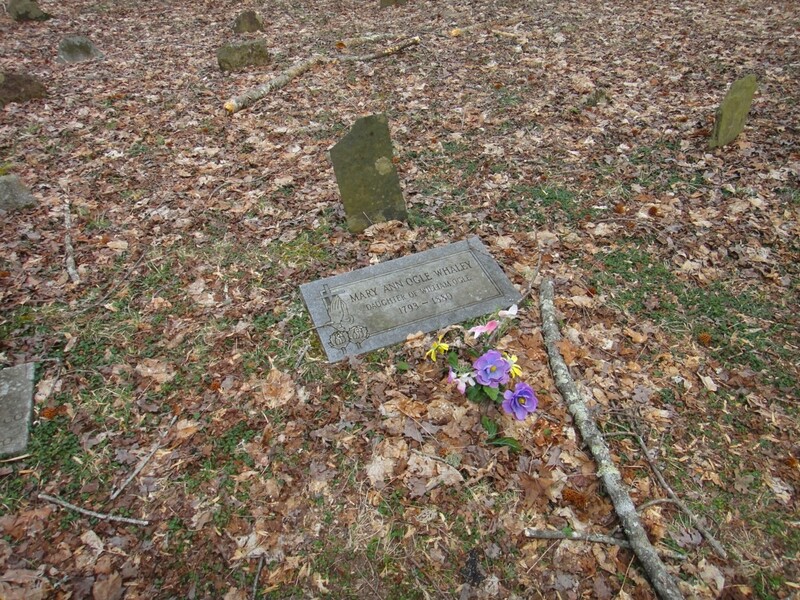 There a gravel road leads up to the Plemmons cemetery, and an old, fainter roadbed goes closer to the creek. Ben and the Mikes were already very familiar with the cemetery, but they were kind enough to take me up there, since I’d never been. 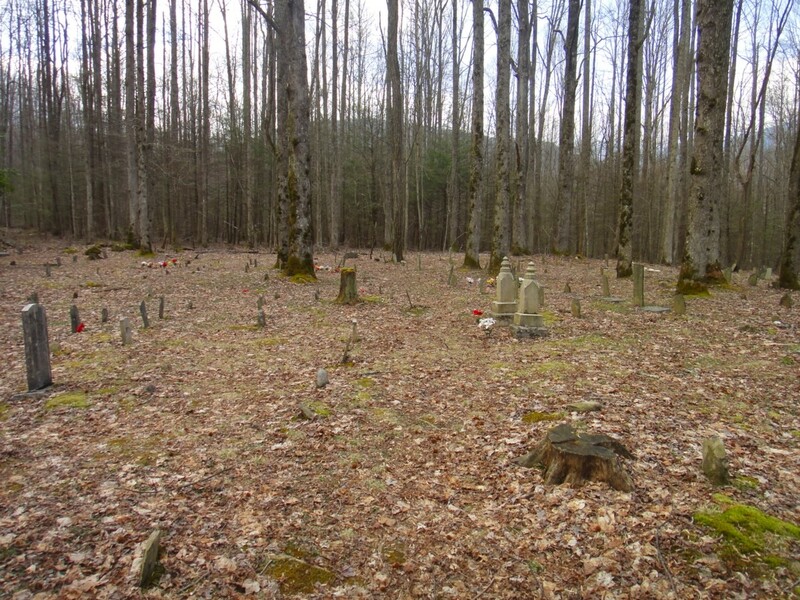 The cemetery is one of the larger ones in the park, bearing silent testimony to the many people who lived and died there before the national park was created. It is populated by Whaleys, Ownbys, Ogles, Rayfields, and Bohanans. Mike M. said in one of his many writings about historic structures in the park, “At least 70% are cousins of mine in one way or another…Maybe you’re old enough to remember the pine box in the living room with all-night singing before the funeral the next day.” That is a fine thing to think about as we gaze over the many different kinds of headstones—some carved professionally and others mere slabs of slate with names scratched by hand into the stone, barely visible. Those were to me the most moving. Soon we had to face up to the crossing of False Gap Prong. It had come down quite a bit since Mike G. and Ben had failed to find a place to cross on their earlier trip, but it was still tough. Mike M. had brought along four plastic garbage bags. The idea was to put a bag around each leg to keep dry. Then the two who crossed first would put stones in them and throw them back over for the other two to use. Mike M. crossed first and did fine. I crossed next and did not do so fine. I couldn’t manage to hold up the bags and hold onto my hiking pole at the same time. Plus, I unintentionally made holes in the bags, and they filled with water. I’m surprised the others didn’t banish me back to wait at the trailhead right then and there for this gross incompetence. Mike G. and Ben did fine (see top photo). Soon we came to old homesites. 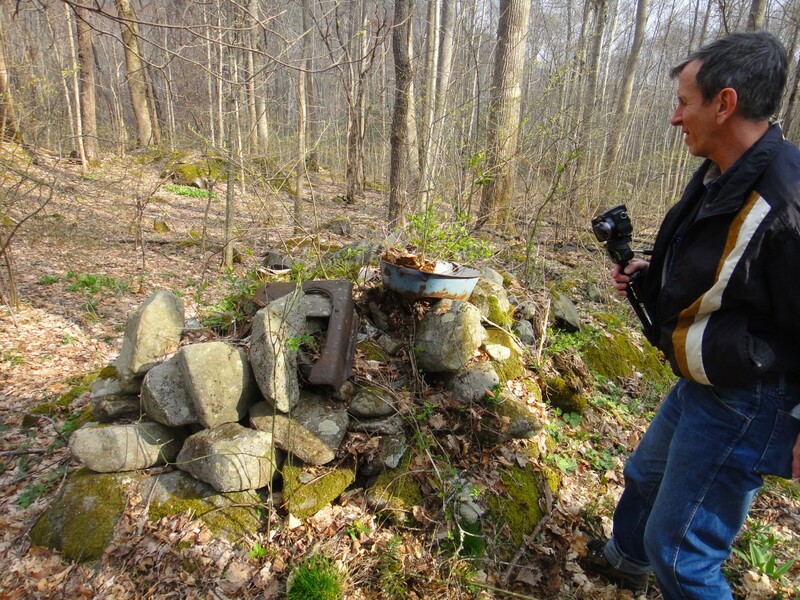 Usually the most prominent feature is the remains of the chimney, and then you usually find rusty old artifacts lying around, such as old pails and washtubs. Spring wildflowers awaited us. 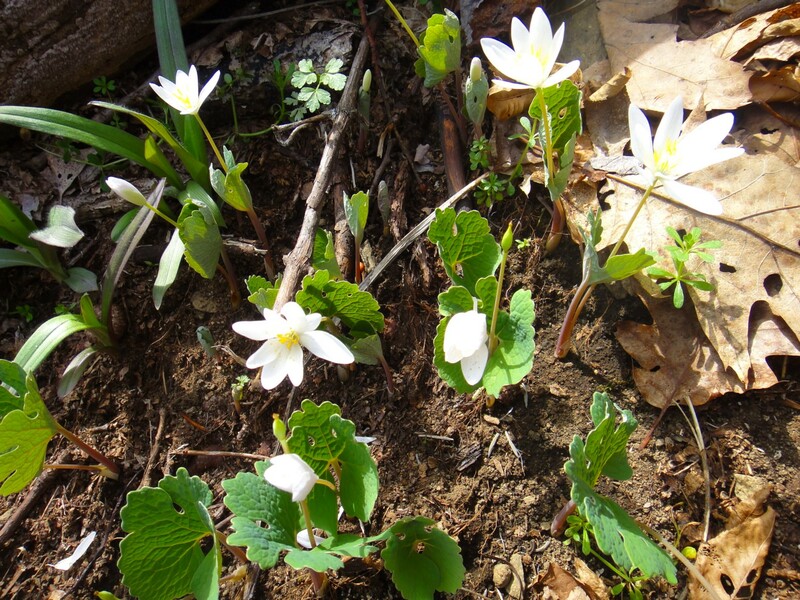 I saw a bloodroot—one of my very favorite flowers. 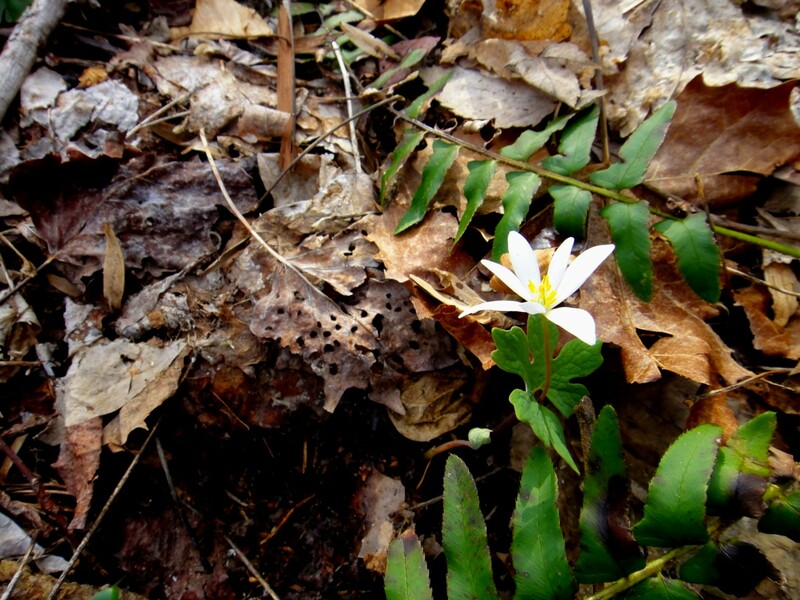 My first bloodroot of the season! 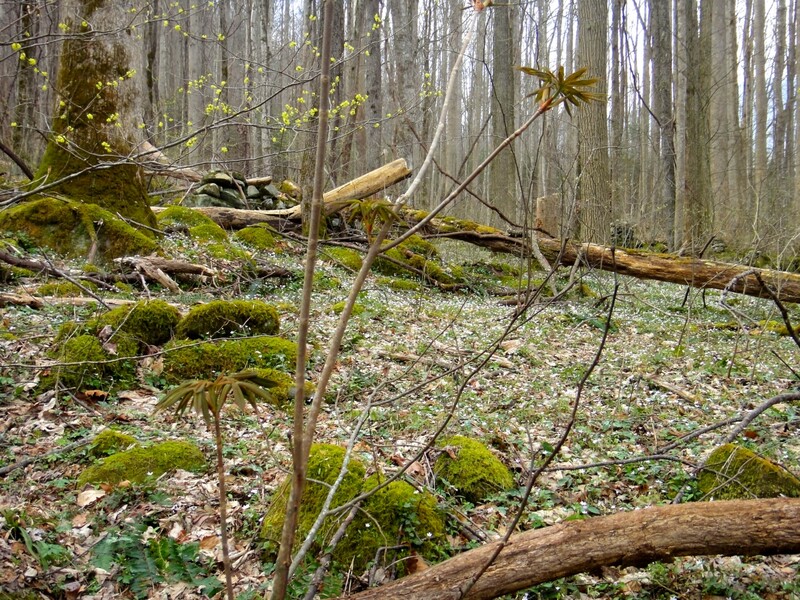 Some of the homesites were lushly carpeted with spring beauties. 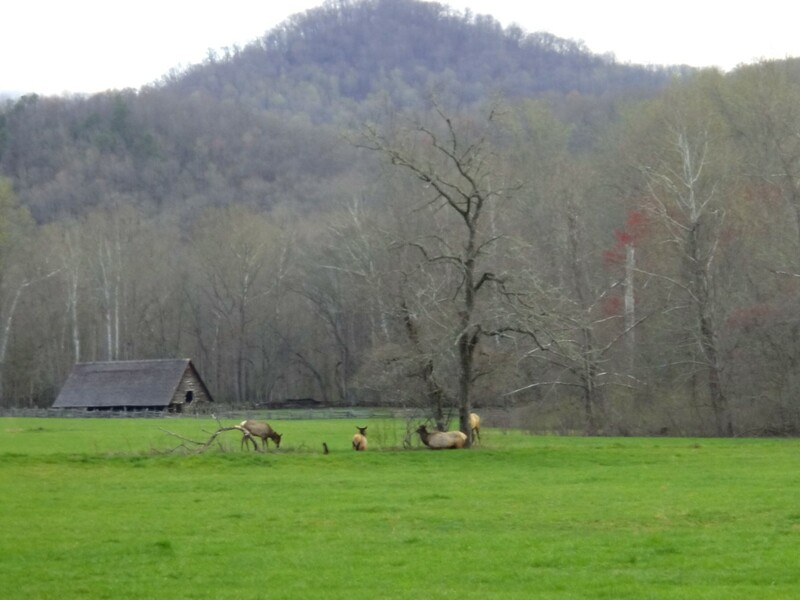 Oh, this is a wonderful time of year to be in the Smokies. 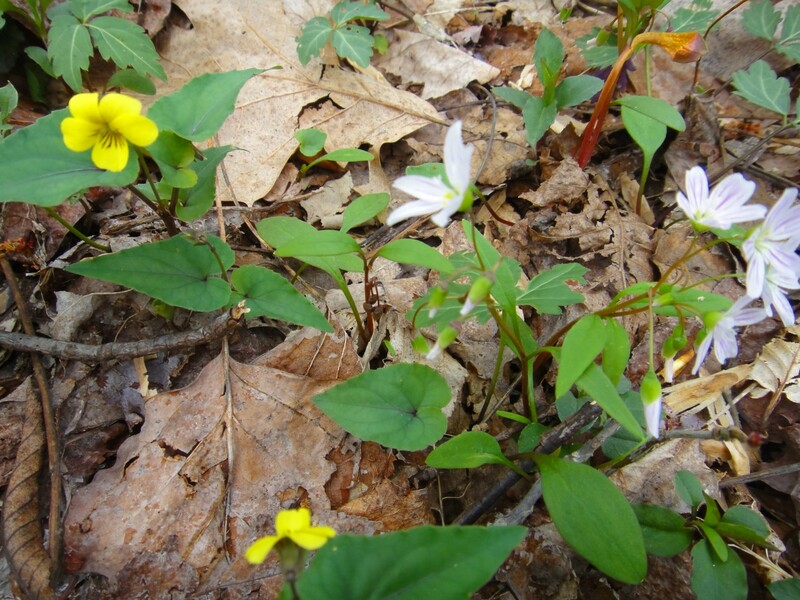 We saw lots of yellow trillium that hadn’t started blooming yet, but the leaves are so beautiful anyway. 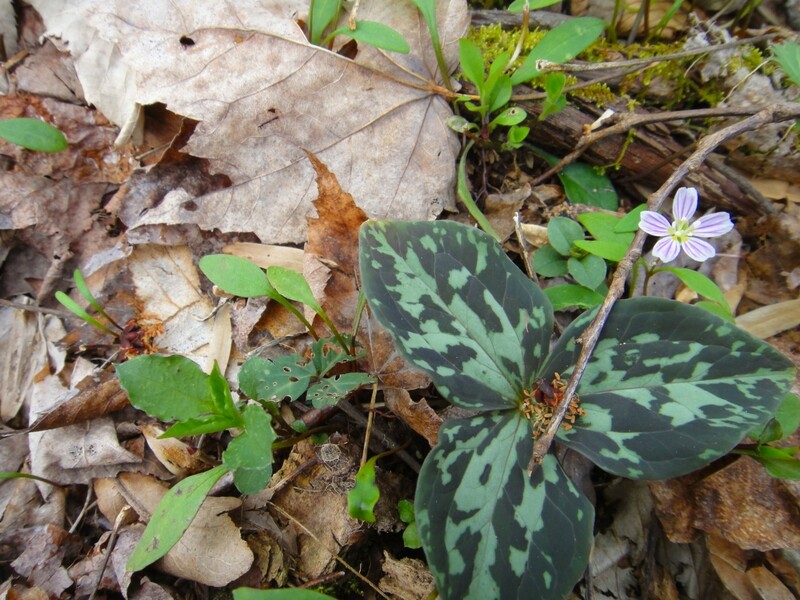 I think I love those and the ones of the trout lily the best for their speckled appearance. Yellow violets were turning their cheery little faces up toward the sunshine. We saw lots of old walls. We looked down on Porters Creek from an angle I hadn’t seen it from before. Mike M. suddenly decided to roost in a tree. 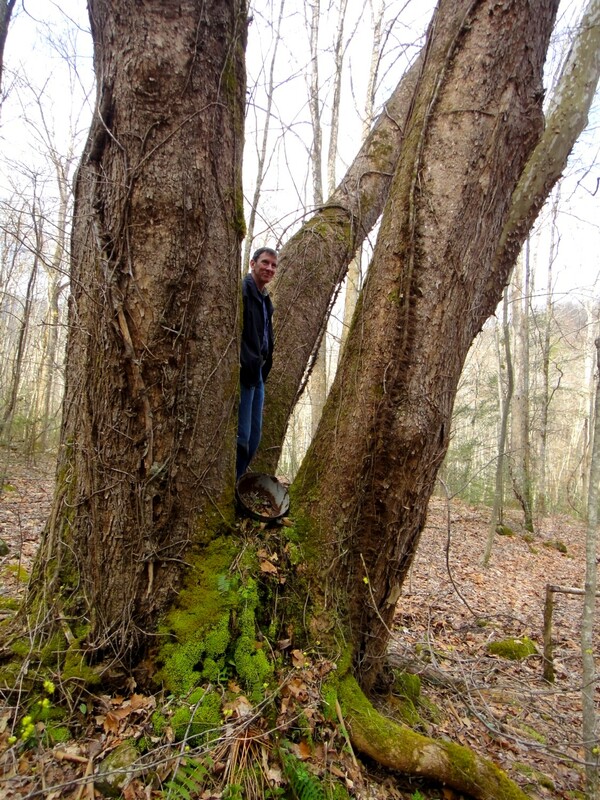 I think this was the multi-trunked sycamore that we found. We came to relics of an old sawmill. And found part of an old horse cart. 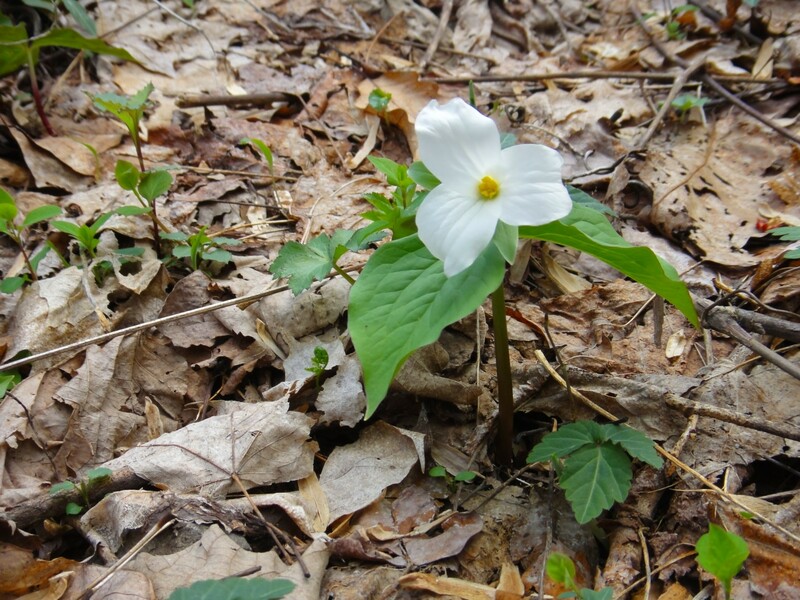 At last we came across a trillium in bloom—a white one, not a yellow one. Soon afterward we came to a very impressive tall chimney. 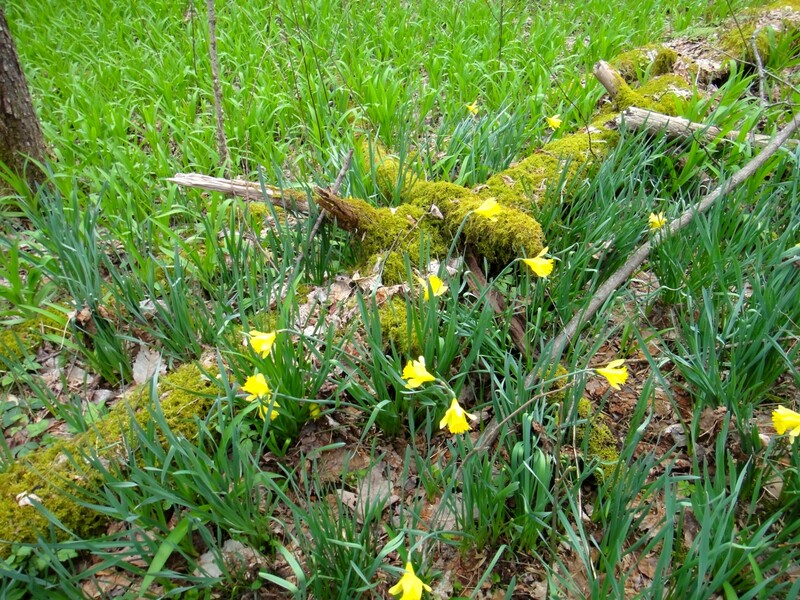 At this homesite we found plenty of daffodils. The foliage behind the daffodils is iris not yet in bloom. Up until this point, we had been climbing gently and not very strenuously toward the Horseshoe. Now we began to climb fairly steeply up to the ridge that forms the western side of the Horseshoe. We got up to a gap and then after a brief rest plunged down the other side. Mike M. led the way at a fast pace. We did a sort of interval training over several ridges—up, down, up, down. Now we were getting our exercise for the day. 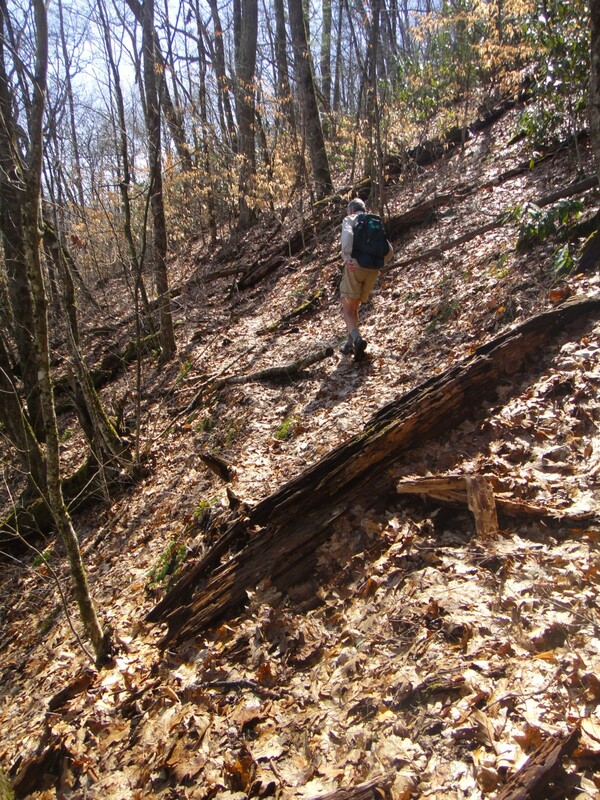 After playing around on the ridges for a while, we headed back to lower ground, Mike M. looking out for particular homesites. 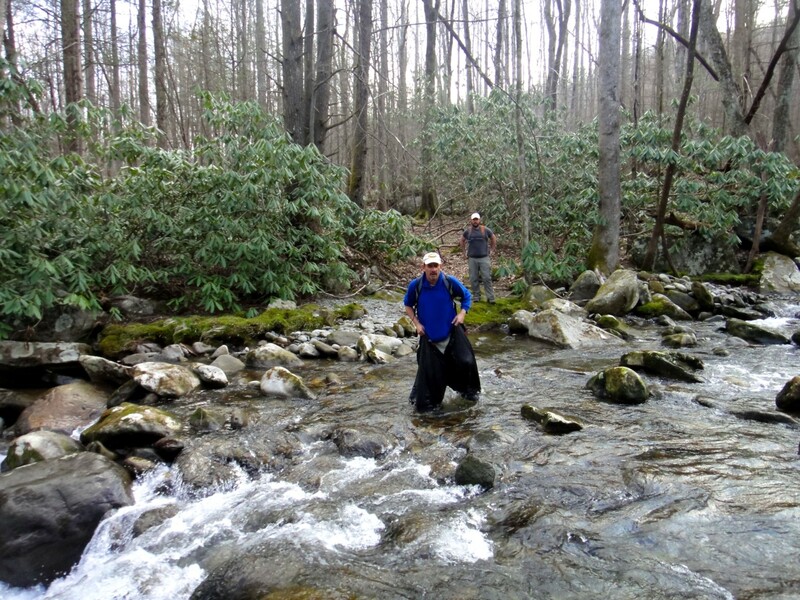 We crossed several small streams and eventually found ourselves back at False Gap Prong. It is truly a beautiful stream. 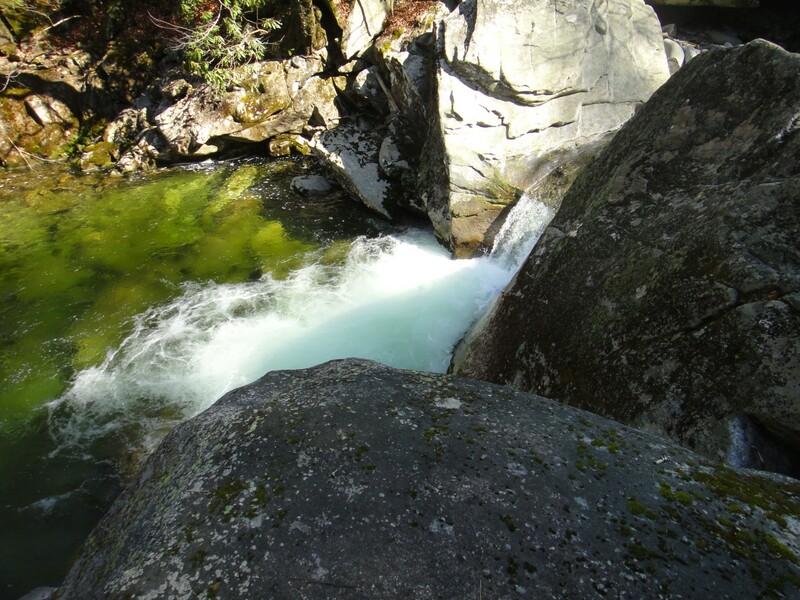 In case you are wondering how it got its name, it comes from the stream’s headwaters at False Gap up on the A.T. I’ve heard False Gap was originally believed to be Porters Gap by the mapmakers of the early 20th century. When they figured out that Porters Gap lies slightly to the west, they renamed the other one False Gap. 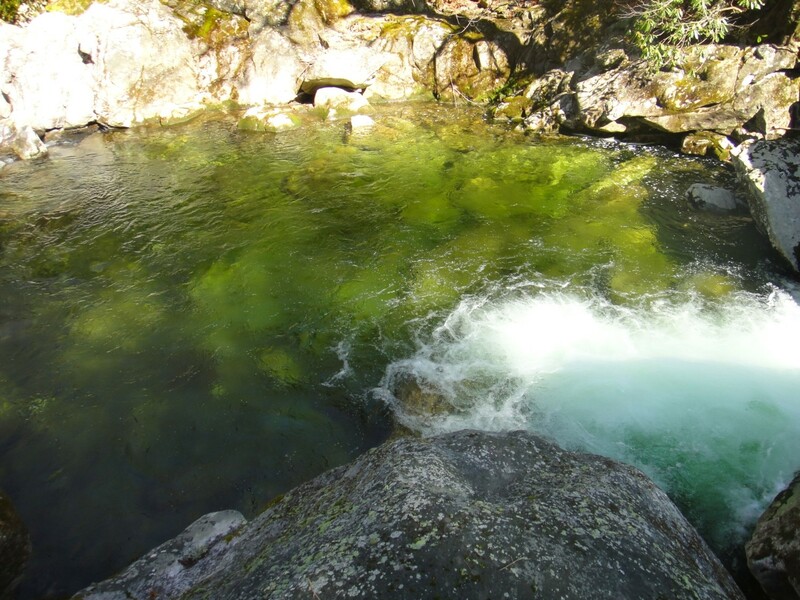 Down in this lower section of False Gap Prong, the stream tumbled over giant boulders and into beautiful pools. Of course, we had to cross back over to the other side again. 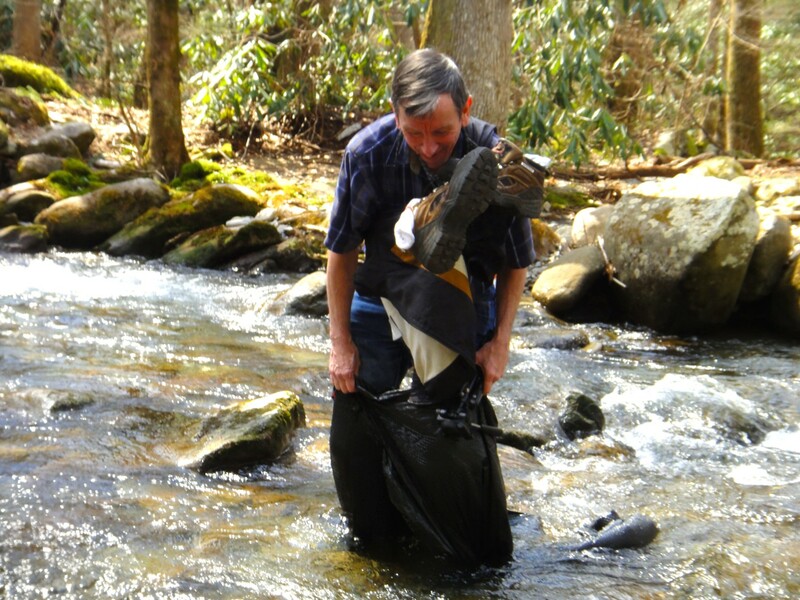 Our black plastic garbage bags were waiting for us, weighted down with stones, and Mike M. had several pairs of white socks neatly draped over a branch, drying from the first crossing. His method was to take boots off before putting garbage bags on—which is probably what would keep them from getting holes. Then he crosses with boots tied by their laces around his neck. 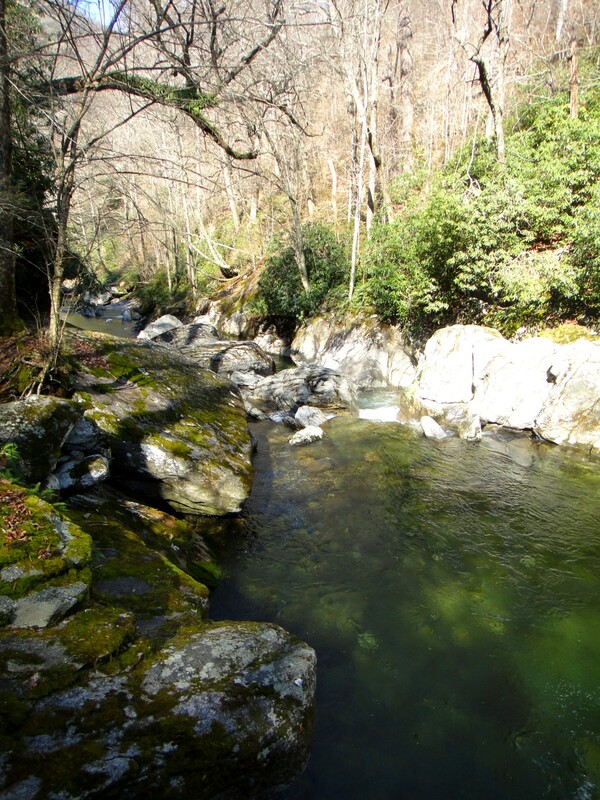 It was a wonderful way to spend a Sunday in early Smokies spring.